A scanner can be a great deal more than a tool used to create pictures to e-mail to Aunt Nellie. It can be your own personal philatelic sleuth. I just purchased a new Canon D1250U2 scanner which can scan to 1200x2400 dpi. This kind of scanner with the right software can be very helpful in detecting varieties in your stamps which may otherwise be difficult to find. Most modern scanners should be able to do this, as long as you can scan at around 600 dpi. You will notice that there is very little difference between these two stamps except in the postmarks. Next, create a negative image as shown in figure 2. The reason for this is that the negative colours have cancelled out the positive colours and neutral grey is left. If this happens, things are going very well. (It’s hard to believe a grey screen is useful, but it is). Now for the fun part. Focus just on the top layer, select the left hand stamp, drag it across and place it on the right-hand side. Then put both layers back on and as carefully as you can align the left stamp on top of the right hand stamp. This is where you will tell how good you were at making your stamps parallel; the better your alignment the easier the next step is. Once again a number of parts should cancel themselves out as you saw in figure 3 (the image will not go completely grey unless the stamps are perfectly aligned). However, any differences between the stamp will now stand out. The black letters MA from the postmark are clearly seen down the bottom left, the marks on the forehead of the king are also clearly seen in black, as is the circular postmark on the bottom right. Interestingly there is also a small black mark on the head of the emu to the right of the king's portrait. This is not a mark from a postmark, but instead shows a difference between the two stamps. We can now see the second circular postmark clearly in black. There is also a mark behind the king's ear and lower down on his neck that does not appear to be from the postmark. Note that the mark near the emu is now not as obvious as it is white. Figure 7 below shows in detail the differences on the king's neck and ear. There are two missing sections of dye. 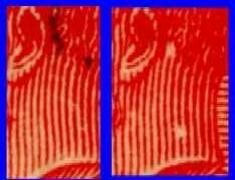 This technique could be used with any two "identical" stamps to reveal hitherto unnoticed differences. Of course, the magnifying glass is the tried-and-true way of looking for varieties without all the technology. But a scanner will help you spot things you were not even looking for! Please send your comments and questions to author Scott Gilmore.